On a team like this, getting the first reset is core to absolutely demolishing the enemy team in the following seconds. This team specializes in pumping out a clean wombo combo or simply a one hit assassination combined with massive follow-up from Jinx resets. Jinx [Marksman] - Potentially the most snowball-prone marksman in the game, Jinx can easily destroy enemy teams if she's left unchecked. The only real way to deal with her is to kill her before her team kills you first. If you fail to this, expect pain, lots of pain. Malphite [Mid] - Picking a Malphite mid-lane may not necessarily be the most intuitive of things. However, with the uptick in AD-based mid-lane players in the game, Malphite actually does quite well. He likely won't be killing too many of those highly mobile assassins, but most players won't have the reaction time to flash away from a Malphite ult. On an AP build, that's an almost guaranteed one-shot once you farm an item or two. Morgana [Support] - Morgana's catch-ability greatly enhances the ability of this team to get that initial first kill. Her black shield also ensures that Jinx stay safe no matter what kind of crowd-control the enemy is packing. If necessary, she can also flash engage with her ultimate combined with a quick Zhonya. 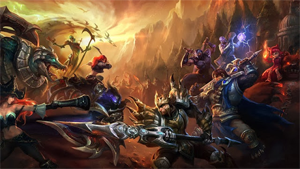 Jarvan IV [Jungler] - Jarvan's ability to isolate enemy champions and engage from absurd distances greatly lends himself to most wombo-combo comps. This one's no exception, and the attack speed boost is also incredibly useful for pumping up Jinx even further. Kennen [Top] - Most of the time, Kennen's ultimate can single-handedly end an enemy team's progression in a team fight, if not simply kill half the team outright. His damage is extremely valuable in this comp since he makes it especially difficult to decide whether they need to itemize against Kennen or Jinx. As a lane bully he's also very difficult to keep down. Kennen and Jarvan do not necessarily go for the same targets. It's better for one to initiate and the other to pick off enemy champions trying to save their allies. Some enemy teams may try to isolate Jinx and take her out. While you don't necessarily need her to utterly destroy enemies, Morgana may want to go on peel duty if Jinx is having trouble staying alive. Countering this team largely means split pushing and avoiding team fights at all costs. Leblanc [Mid] - Long range quick assassins are a Leblanc specialty, and will help you as you try to quickly kill Jinx and get out before the enemy team is any wiser. Gragas [Jungle] - Getting a jungler that won't be instantly burst down combined with a massive disengage is ideal for staying alive against this team comp. Jax [Top] - When it comes to split-pushing, Jax is king. He's also one of the few melee champions that can actually theaten Kennen using his gap closer + stun. Nami [Support] - When it comes to sustain and crowd-control at the same time, nobody does it better than Nami. Toss her out there and your team won't be disappointed. Tristana [Marksman] - When it comes to fighting a team with this much engage, picking up Tristana for her massive ranged escape mechanism and Buster Shot is key. Overall this counter team is strong, but takes a great deal more skill to execute correctly.